A key question that needs to be addressed in the creation of an Indigenous, culturally relevant educational process is how to create a schooling environment that reflects Indigenous culture and instils traditional values while providing the students with the skills they need to “survive” in the modern world. Indigenous knowledge thus becomes important to understand. This knowledge is crucial to creating a culturally relevant space, pedagogy, and environment for teaching Indigenous children. In many Indigenous cultures, the Medicine Wheel metaphor contains all of the traditional teachings and can therefore be used as a guide on any journey, including the educational process. 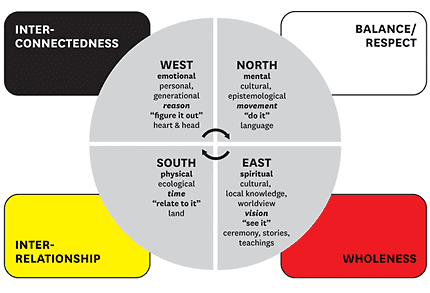 While there is some variation in its teachings and representations, the underlying web of meaning to Medicine Wheels remains the same: the importance of appreciating and respecting the ongoing interconnectedness and interrelatedness of all things. Therefore, there is no “right” or “wrong” way of representing or using Medicine Wheels: all forms hold particular meaning to the various Indigenous nations while all transmit a common understanding of the interconnectedness and interrelatedness of all things. Within Medicine Wheels there are many, many “rings” of teachings that exist. A ring of teaching is created by considering a part of the teaching from each of the four directions. These rings of teachings have significant meaning independently but are all the more powerful when understood as a collective of interdependent knowledge teachings and practices. Some of these rings include: seasons (spring, summer, fall, winter), times of day (morning, afternoon, evening, night), stages of life (infant, youth, adult, elder), and life givers (earth, sun, water, air). In order to create the movement required by the northern direction, one must re-visit the other directions to achieve a 360-degree vision. By going to the east where one visions to transform that which is, one can actively create a better life for oneself and others. Indigenous people can envision how they can be active in the “creation of oppositional analytical and cultural space.” Visioning allows them to engage in the hopeful utopian thinking necessary for radical transformation. Once a guiding vision is received or created, strategies can then be planned to help actualize it. Each person then has the responsibility to do the work required to fulfill the vision. Indigenous people are fighting to actualize their visions for change in the education of their children. A revolutionized world will not “come into existence in a linear way, as the result of a single-minded drive, but in a cyclic, circular way, working in all dimensions of a culture, moving from one position to another, not in reaction but in interaction with other forces.” Moving from linear models to the interconnectedness of the circle can guide the development of pedagogy and vision for the future. It is necessary to consider Indigenous knowledge as a collection of knowledges from different Indigenous nations. Indigenous knowledge is therefore culture specific, contained within the local knowledge and worldview of the nation. It therefore also has to be ecological, where the knowledge is contained within the land of the geographic location of the nation. Knowledge is also contained within the people of the nation. Indigenous knowledge then becomes personal and generational, as there is a process of generational transmission. Indigenous knowledge is epistemological, in that each nation culturally determines for itself how it knows what it knows. While Indigenous worldview articulates that Indigenous people need to develop themselves, including their children, in a holistic way that addresses their spiritual, physical, emotional, and mental capacities, they need to address how to transmit learning through all of those personal aspects. The spiritual can be touched through ceremony, teachings, and stories. The physical can be transmitted through the land, while the emotional aspect can be developed through a balanced connection between the heart and the head. Mental capacities can be developed through ancestral languages and integrative learning. Moving from linear models to the interconnectedness of the circle can guide the development of pedagogy and vision for the future. Wisdom becomes the goal of any educational process including living – to say that we are truly knowledgeable as a person is to say that we not only “know” what is valued by a nation, but that we have lived our life in such a way that we have experienced what we know and can therefore be considered wise. Indigenous knowledge and worldview is attained by choosing to do what is necessary to obtain multiple perspectives from which to view the world. This in-depth searching for knowledge is what leads to wisdom. Wisdom is achieved by first becoming aware of the learning through all the senses, requiring the learning to be introduced to the students in multiple modalities. Understanding is achieved by providing students with enough time to solidify the learning so that they are able replicate the learning. A deeper understanding is achieved by students relating to the learning at a deeper level to become knowledgeable to the point that they are able to apply the learning in any situation. To say that the students have achieved wisdom requires that they are able to create some action with the learning and teach it to others. The Anishinaabe Bimaadiziwin Cultural Healing and Learning Program (operational from 2002-2006) was created to fulfill the cultural and academic needs of Anishinaabe children in the Burleigh Falls (Ont.) area. The program involved a synthesis of Anishinaabe worldview, spirituality and traditional education philosophy, incorporating these components into an Anishinaabe culture-based school program for Junior Kindergarten to Grade 12. The school was registered as a private school with the Ontario Ministry of Education and the curriculum was organized on a Medicine Wheel framework, where cultural teachings and traditional practices were addressed in the corresponding season on the Medicine Wheel. A holistic educational experience was provided through a balanced emphasis on all personal aspects of the student. The spirit of the student was celebrated through daily ceremony such as a morning circle (similar to a sunrise ceremony), and the learning of traditional teachings and stories. The physical aspect of the student was actualized by interacting with the land through traditional practices such as maple syrup making, wild rice picking and fasting (a traditional ceremony of personal physical sacrifice to gain spiritual enlightenment). The emotional aspect of the student was addressed by an emphasis on healing and connecting the heart with the head through weekly healing circles, individual counselling, and following the seven sacred teachings (core values often referred to as the seven grandfather teachings). The mental aspect of the student was developed through the teaching and learning of the Anishinaabe language and integrative learning that blended Euro-Canadian and Anishinaabe knowledge, such as the study of earth and space systems in science and the Anishinaabe traditional worldview of all creation along with its teachings, stories, and songs. 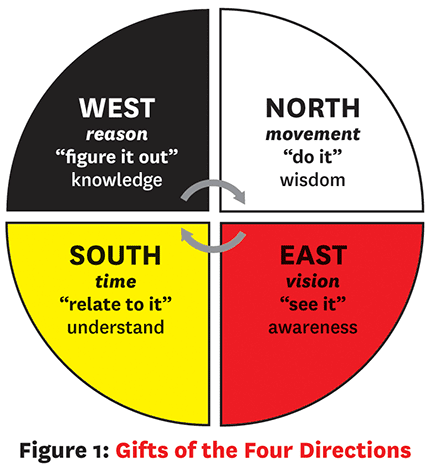 The Anishinaabe learning process of awareness, understanding, knowledge, and wisdom as presented on the Medicine Wheel were actualized on an ongoing basis to ensure complete and deep learning occurred. An example of this included providing the students with the awareness of their culture by allowing them to experience it with all their senses (seeing it, tasting it, feeling/touching it, smelling it, hearing it) and then expecting them to show that they understood it by replicating it, such as being able to sing a traditional song. Knowledge of the learning was illustrated by the students in the school when they applied the learning in any situation, such as when a child made a connection between the concept of greed and a traditional Nanaboozhoo story. The ability to teach their culture to others and thus prove wisdom was achieved by becoming the teacher and sharing their culture with other children through workshops with Brownies or Cub Scouts groups. While the above examples are specific to an Anishinaabe culture-based educational setting, the teachings of Medicine Wheels provide an educational framework that can be applied to any educational setting. The fundamental concepts of wholeness, inter-relationship, inter-connectedness and balance/respect are valuable for all. EN BREF – Cet article explore les enseignements des roues de médecine selon la perspective culturelle anishinabe. L’accent est mis sur ses applications en éducation par le biais de la pédagogie et de la transmission des enseignements des roues de médecine. Ces concepts sont illustrés par un exemple pédagogique pratique de l’emploi de la roue de médicine dans le cadre du programme culturel de guérison et d’apprentissage des « Anishinabe-Bimaadiziwin », offert dans une école basée sur la culture anishinabe. The term “Medicine Wheel” was established when stone constructions in the shape of wheels were found on Medicine Mountain. J. Sanderson, The Cree Way: Traditional paths to learning (masters’ thesis, University of Saskatchewan, 1991), 51. J. Bopp, M. Bopp, L. Brown, and P. Lane, The Sacred Tree (Four Worlds Development Project, 1984), 9. S. Calliou, “Peacekeeping Actions At Home: A Medicine Wheel model for a peacekeeping pedagogy,” in First Nations Education in Canada (UBC Press, 1995), 51. K. Absolon, Building Health From the Medicine Wheel: Aboriginal program development. Paper presented at the meeting of the Native Physician’s Association (Winnipeg, Manitoba, March 1994). Absolon, Building Health From the Medicine Wheel, 18. F. J. Graveline, Circle Works: Transforming Eurocentric consciousness (Halifax, NS: Fernwood Publishing, 1998), 182. Dumont in S. Stigelbauer, The Individual is the Community; The Community is the World; Native Elders Talk About What Young People Need to Know. Paper presented at the meeting of the American Educational Research Association (San Francisco, CA, 1992). C. T. Mohanty, “On Race and Voice: Challenges for liberal education in the 1990’s,” in Between Borders: Pedagogy and the politics of cultural studies, eds. H. Giroux and P. McLaren (New York, NY: Routledge, 1994), 148. S. Benhabib, Situating the Self: Gender, community, and post-modernism in contemporary ethics (New York, NY: Routledge, 1992). G. Cajete, Look To The Mountain: An ecology of Indigenous education (Asheville, NC: Kivaki Press, 1994). French in K. Gould, “Feminist Principles and Minority Concerns: Contributions, problems, and solutions,” Affilia 2, no 3 (1987): 18.